Justin Cronin has the PEN/Hemingway Award, the Stephen Crane Prize, and the Whiting Writer’s Award for his fiction. Born and raised in New England, Cronin attended Harvard University. He currently lives with his wife and children in Houston, Texas and is Professor of English at Rice University. Here’s Justin Cronin’s website. CLICK HERE FOR A FEW MORE TITLES BY JUSTIN CRONIN. The Passage — (2010-2012) Publisher: “It happened fast. Thirty-two minutes for one world to die, another to be born.” First, the unthinkable: a security breach at a secret U.S. government facility unleashes the monstrous product of a chilling military experiment. Then, the unspeakable: a night of chaos and carnage gives way to sunrise on a nation, and ultimately a world, forever altered. All that remains for the stunned survivors is the long fight ahead and a future ruled by fear — of darkness, of death, of a fate far worse. As civilization swiftly crumbles into a primal landscape of predators and prey, two people flee in search of sanctuary. FBI agent Brad Wolgast is a good man haunted by what he’s done in the line of duty. Six-year-old orphan Amy Harper Bellafonte is a refugee from the doomed scientific project that has triggered apocalypse. He is determined to protect her from the horror set loose by her captors. But for Amy, escaping the bloody fallout is only the beginning of a much longer odyssey — spanning miles and decades — towards the time and place where she must finish what should never have begun. 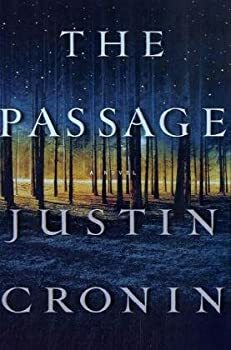 With The Passage, award-winning author Justin Cronin has written both a relentlessly suspenseful adventure and an epic chronicle of human endurance in the face of unprecedented catastrophe and unimaginable danger. Its inventive storytelling, masterful prose, and depth of human insight mark it as a crucial and transcendent work of modern fiction. Justin Cronin’s 2010 apocalyptic-vampire thriller, The Passage, debuted in the midst of the mass consumer love affair with the weird and supernatural. In the evolution of the vampire in pop culture, Anne Rice turned Bram Stoker’s blood-sucking villain into a romantic lead. Stephenie Meyer morphed Lestat into a high school heart-throb. Justin Cronin pulled the genre up and out of its romanticized and stagnating plateau to give the publishing world something more epic, more poignant, more ... genuine. The lengthy journey from Justin Cronin’s vampire apocalypse The Passage comes to a full conclusion (and maybe a bit more) in the third and final book, The City of Mirrors. If The Passage was absolutely great (and it really, really was), and the sequel The Twelve was good but not quite as, mostly due to it feeling much more its length than the first book did, then The City of Mirrors falls somewhere in between, though my guess is that some will react more negatively to a few of its elements than I did. It’s impossible to discuss this final book without spoilers for books one and two, so fair warning. Also, I’m going to assume you’ve read the first two books and so won’t other re-detailing characters and events.